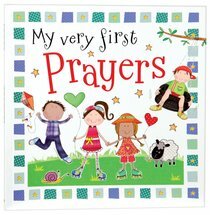 :A carefully selected collection of prayers are presented in a bright and colourful picture book format that is perfect for young children. With beautiful illustrations and sweet, rhyming text, My Very First Prayers makes prayer easy and accessible for young children. This charming book encourages children to talk to God and share their lives with Him. The new paperback format also makes this a perfect gift for churches looking for prize giving or gift and award ideas. About "My Very First Prayers"